Murchison Falls National Park is the most visited place in Uganda. It is situated in the northern part of Albertine Rift Valley. A place where the massive Bunyoro escarpment amalgamate into the enormous plains of Acholi land. It’s well known to be one of Uganda’s ancient conservation areas. In 1926 named a game reserve set up to protect the savannah grassland. Wildlife includes lions, leopards, elephants, giraffes, hartebeests, chimpanzees, and many bird species. The park covers an area of about 3,893km2 and its known to be one of Uganda’s well protected area. The park is acknowledged for receiving prominent international visitors who have done activities such as boat cruise, hiking as well as cycling the Nile corridor of the falls. The temperatures tend to be hot and the affected months are December, mid-February, June as well as July. The rainy season is between April and November. Kibale Forest National Park is situated in the peaceful Ndali-Kasenda crate. Known to be one of Uganda’s most gorgeous tropical forest and it covers an area of about 795km. The northern part of Kibale has a peak of about 1590m above sea level and it’s known as the wettest area with an annual rainfall of about 1700mm.The rainy months include March-May as well as September-November. 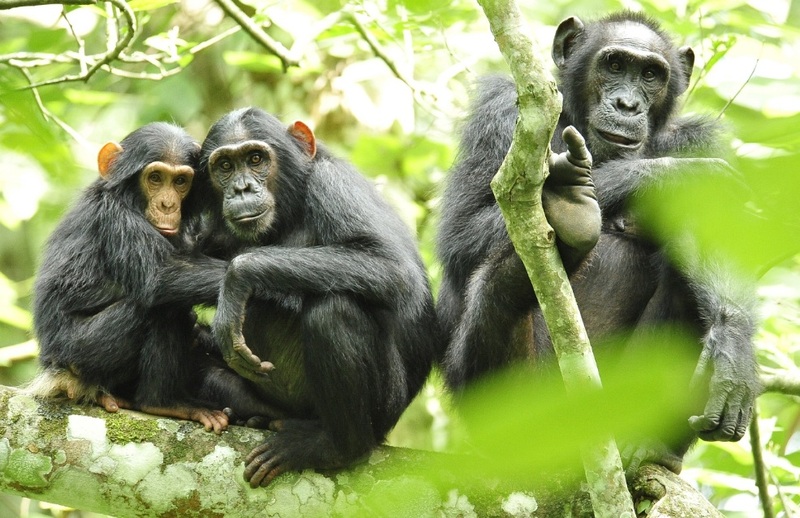 Kibale Forest National Park is one of the best safari destination in Africa for chimpanzee tracking. This is place has numerous forest wildlife, most especially 13 species of primate coupled with chimpanzees. Southern Kibale borders Queen Elizabeth National Park and collectively these preserved areas maintain a 180 kilometre long migration corridor for wildlife that stretches from the remote southern sector of Queen Elizabeth National Park in Ishasha, to the north of Kibale in Sebitoli. Queen Elizabeth National Park is situated in western Uganda, covering the districts of Kasese, Kamwenge, Bushenyi, and Rukungiri. Its located approximately 376 kilometres southwest of Uganda's capital and largest city, Kampala. The town of Kasese is just outside the north-eastern edge of the park, while the town of Bushenyi is just outside the park's south-eastern boundaries. The park is named after Queen Elizabeth II and was established in 1954 but later renamed Ruwenzori before it returned to its royal name. The park is known for its wildlife, like the hippopotamus, elephants, leopards, ,and chimpanzees. It is now home to 95 species of mammal and over 500 species of birds. The area around Ishasha in Rukungiri District is famous for its tree-climbing lions. The park is also famous for its volcanic features, including volcanic cones and deep craters, with crater lakes, like the Katwe craters, from which salt is extracted. The park includes Maramagambo Forest and borders Kigezi Game Reserve, Kyambura Game Reserve, and Kibale National Park in Uganda, and Virunga National Park in the Democratic Republic of the Congo. 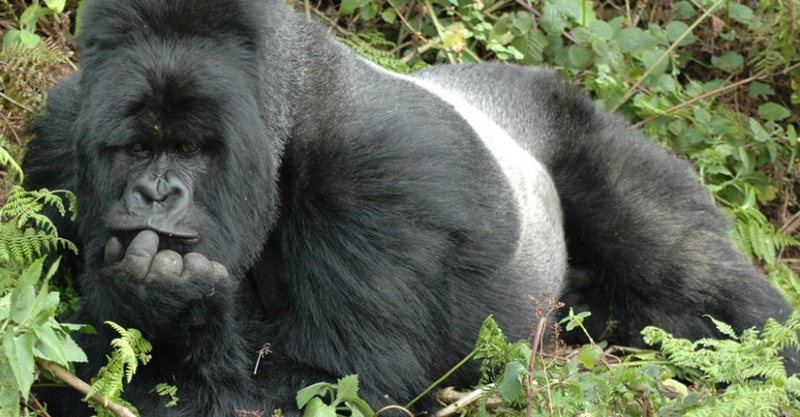 Mgahinga Gorilla National Park is located in the Virunga Mountains and neighbouring the Volcanoes National Park in Rwanda and the Virunga National Park in the Democratic Republic of the Congo. It was established in 1991 and is a part of the Virunga Conservation Area, which is 434 km. Mgahinga is situated about 15 kilometres south of the town of Kisoro and approximately 55 kilometres west of Kabale, the largest city in the sub-region. The entire park is located in Bufumbira County, in Kisoro District. The park is the smallest national park in Uganda is one of the only two parks in Uganda that offer habitat for the endangered mountain gorilla. Bwindi Impenetrable National Park is located in southwestern Uganda along the Democratic Republic of Congo border next to the Virunga National Park and on the edge of the Albertine Rift. It covers 331 square kilometres of jungle forests and contains both montane and lowland forest and is accessible only on foot. The park was named on of the World Heritage Site by UNESCO . The forest is one of the richest ecosystems in Africa and the diversity of species is a feature of the park. The park provides habitat for some 120 species of mammals, 348 species of birds, 220 species of butterflies, 27 species of frogs, chameleons, geckos and many endangered species. Floristically Bwindi is amongst the most diverse forests in East Africa, with more than 1,000 flower plant including 163 of trees and 104 of ferns. The northern sector is rich in species of the Guineo-Congolian flora. In particular the area shares in the high levels of endemism of the Albertine Rift. It is a sanctuary for colobus monkeys, chimpanzees and numerous birds. It also distinguished for the Bwindi gorillas, half the world's population of the critically endangered mountain gorillas. 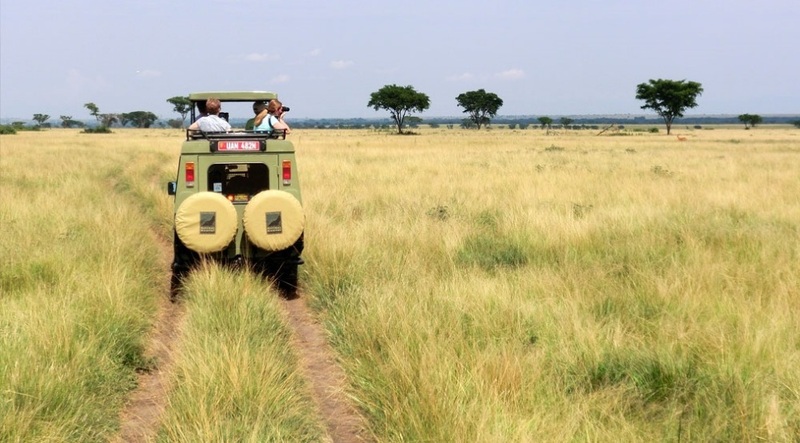 Kidepo Valley National park is situated in Kaabong District, in the north eastern corner of Uganda. The park is located approximately 220 kilometres northwest of Moroto, the largest town in the sub-region. Its location is approximately 520 kilometres northeast of Kampala, Uganda's capital city. The north western boundary of the park runs along the international frontier with South Sudan and borders against the Kidepo Game Reserve. The park was home to Dodoth pastoralists and Ik farmers before it was changed to a game reserve by the British colonial government in 1958. The purpose was both to protect the animals from hunting and to prevent further clearing of bush for tsetse fly-control. Lake Mburo National Park is situated in Kiruhura District in the Western Uganda. The park is located just 30 kilometres to the east of Mbarara the largest city in the sub-region and 240 kilometres west of Kampala, Uganda's capital city. The park which is the smallest of Ungandan national parks has a variety of animals such as zebras, impala, buffalos, and over three hundred bird species. Kimbla-Mantana African Safaris operate the only luxury tented camp inside the national park - Lake Mburo Tented Camp. It was established in 1933 as a Controlled Hunting Area and upgraded to a Game Reserve in 1963. The Uganda Wildlife Authority, which manages the park announced plans to introduce balloon tourism in the park in 2009. Semuliki National Park is situated in Bwamba County, a remote part of the Bundibugyo District in western Uganda. Semuliki is one of Uganda’s newest national park after being made a national park in October 1993. The park is one of the richest areas of floral and faunal diversity in Africa, with various bird species. It lies on Uganda’s border with the Democratic Republic of the Congo and is managed by the Uganda Wildlife Authority. The park is part of a network of protected areas in the Albertine Rift Valley. The local people carry out subsistence agriculture and use the park’s forests to supplement their living. The local obtain from the forests include fruits and vegetables, bushmeat, herbal medicines, and construction materials. Mount Elgon National Park is exceptionally split down the middle by the Kenyan-Ugandan border. The park is an important water catchment for the Nzoia River, which flows to Lake Victoria, and for the Turkwel River which flows into Lake Turkana. It is 140 kilometres northeast of Lake Victoria and covers an area of 1,279 square kilometres divided by the border of Kenya and Uganda. The Ugandan part of the park was established in 1992 and it covers 1,110 square kilometres and the Kenyan part covers 169 square kilometres which was established in1968. The park has animals like the elephants, buffalo and a variety of small antelope, duiker and forest monkey. The park has a variety of sets of cliffs, caves, waterfalls, gorges, mesas, calderas, hot springs, and the mountain peaks. The most popular areas are the four passable , vast caves where frequent night visitors such as elephants and buffaloes come to lick the natural salt found on the cave walls. Kitum cave, with overhanging crystalline walls. Rwenzori Mountains National Park is situated in Rwenzori Mountain in the south-western Uganda along the Ugandan-Congo border. The park has Africa's third highest mountain peak and many waterfalls, lakes, and glaciers. The park is known for its beautiful plant life. Rwenzori was established in 1991 and was chosen a World Heritage Site in 1994 by UNESCO for its outstanding natural beauty. The park has many species that are widespread to the Albertine Rift system, and there are several endangered species in the park. The park has excellent trekking and climbing opportunities with spectacular views and unusual scenery.